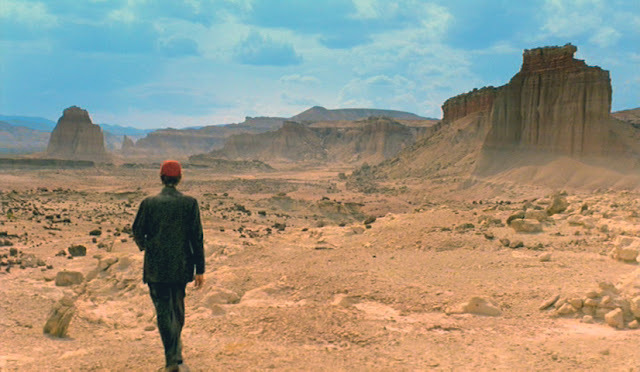 A man is walking through the desert. Where he comes from and where he's going to, nobody knows. Not even himself. Aimlessly he wanders through the emptiness, like tumbleweed. There are a few movies which you know you're going to like from the very first second. Movies whose images are so beautifully drawn, it's like you are walking through an art gallery. And you don't want the movie to movie on, because you want to study the colors and look at the clouds and breathe the air and feel the gravel under your feet; and suddenly the world around you is but the movie, and nothing else. Deep inside the beauty lies a mystery. Because nothing can come of nothing; and our man in the desert has a past, and maybe even a future. Luckily, he is in no hurry to tell his story, and will only speak to those who cannot stand his silence no more.